Rick Perlstein traces the antecedents of contemporary American politics to the period 1965-1972, presenting Richard Nixon as a central figure in creating a foundation for today’s bitter partisanship. Perlstein builds his story around the 1966, 1968, 1970, and 1972 elections, where Nixon, “the brilliant and tormented man struggling to forge a public language that promised mastery of the strange new angers, anxieties, and resentments wracking the nation in the 1960s,” acted as a critical participant. The author argues that during this time period, Americans intensely divided into two general groups, “each equally convinced of its own righteousness, each equally convinced the other group was defined by its evil.” Richard Nixon exploited the fears and rages of those Americans who resented elites and activists, further tearing apart the United States into warring political factions and establishing what Perlstein terms “Nixonland.” The nation of Nixonland persists today in America’s polarized electorate, which remains incapable of escaping the feuds initiated in the 1960s. The author contemplates why Americans elected two presidents from different parties in landslides over a matter of eight years (Democrat Lyndon Johnson in 1964 and Republican Richard Nixon in 1972). He concludes that as Democratic liberalism collapsed under the weight of intense unrest at home and violence in Vietnam during the 1960s, Nixon sought to build a new political coalition among Americans who loathed the chaos permeating their society. 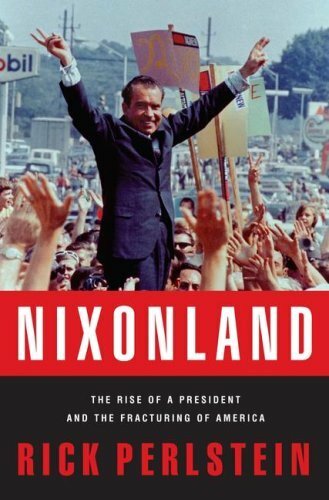 Perlstein argues that Nixon particularly courted white southerners and northern working-class ethnics who resented the burgeoning counterculture, antiwar protestors, and Democratic embracement of civil rights. Yet as Nixon demonized his detractors and successfully captured the presidency in 1968, Democratic victories in the 1970 midterm elections and his increasing paranoia led him to conclude that his failure to be re-elected in 1972 would lead to the downfall of the United States, with its governance placed again in the hands of liberals now all the more influenced by civil rights activists, antiwar protestors, and rebellious youth. These obsessions caused him to resort to any means necessary to win a second term, leading to his own ruin in the Watergate scandal. An interview with Rick Perlstein by History News Network.